Microsoft has released Windows 10 Build 14931 for Slow Ring insiders and made ISO images official download for those who want to perform clean install. With the official Windows 10 Build 14931 ISO images, users can perform an in-place upgrade to latest version of Windows 10, or perform clean install to latest version of Windows 10. Windows 10 Build 14931 also called Redstone 2 branch is an upcoming feature update for Windows 10. The build brings two fixes issue from same build which previous released for Fast ring insiders. To check the details what’s fixed for Windows 10 Insider Preview Build 14931 for Slow ring, just click here. 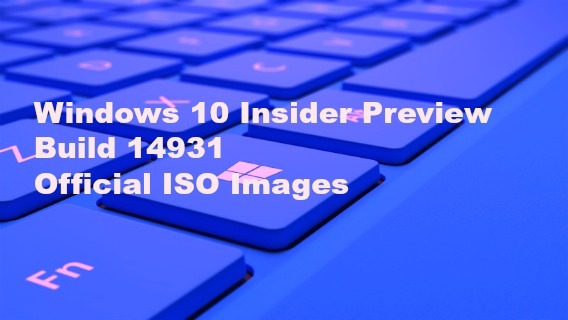 ISO images of the Build 14931 are available as well from Microsoft website. You can download and follow in-screen instruction how to create bootable USB drive and how to do a fresh Windows 10 installation. To download ISO images for other Windows 10 builds head to here.